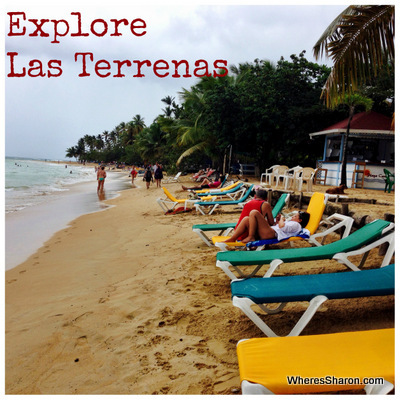 I was excited to leave Cabarete for the weekend to check out the town of Las Terrenas on the Samana peninsula. Our guide book describes it as a “cosmopolitan town”. That’s not how I would describe it, but it is an awesome place! 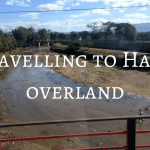 Despite the fact that it is only 158km between the two places, it is an annoying journey which meant an early start, three guaguas and nearly 6 hours. 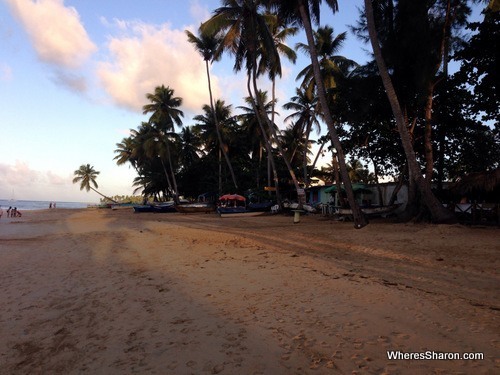 You can read about it in the adventure of getting from Cabarete to Las Terrenas. After all this, and the fact that Z woke us up at 2:45am when he vomited everywhere in his bed and then in ours, we were quite exhausted. Unfortunately, this was how we stayed during our stay, especially since Z woke us up sick again the next night and on our second night in Las Terrenas, both J and S woke up with stomach problems! 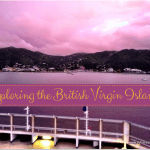 Despite this, we did manage to get to see a fair bit of Las Terrenas. We loved what we saw and our lovely hotel, but we were very tired and, unfortunately, it felt like we did not make the most of our stay. We still had a reasonable look around and enjoyed our stay though! The beach is pretty. There are many palm trees and it has the beautiful blue water that you expect for a beach holiday on a Caribbean island, BUT it is quite narrow in the main part of Las Terrenas. On the upside, the beach is not that built up. There are not resorts between the road and the beach so access is easy. Rather than lots of expat run pubs, there are lots of cute little food stalls, many in tin sheds. On one outing, I even came across a small makeshift fish market right on the beach. As we walked further away from the town, it actually seemed to get more touristy, but it was still quite low key. There are some lounge chairs available, but it is not overrun with them. There was also a cute little playground right on the beach. Got to love that! 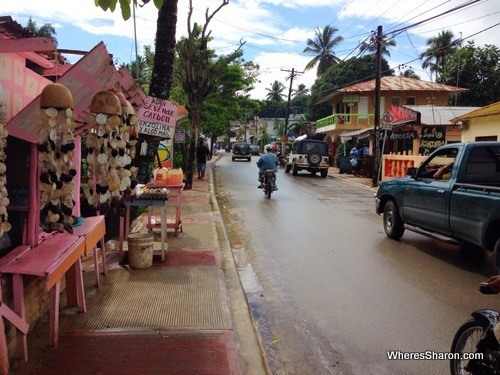 The town, at least the tourist part of Las Terrenas near the beach, is reasonably busy but thankfully the one way streets stop it being crazy. It is a nice place to have a little wander around. There are some good looking shops and restaurants. 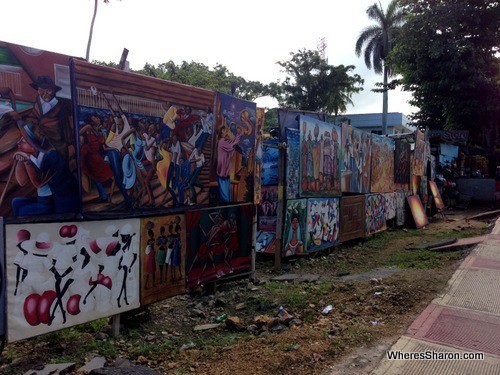 I particularly liked the open air art shops that were around, although I did wonder what happens with the frequent showers. There is some great food around with a variety of options. 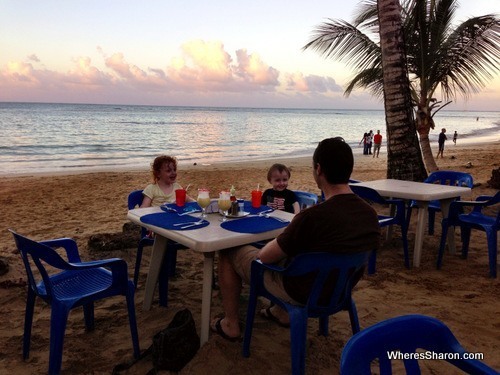 You can eat on the beach at a stall or in a fancier restaurant. The fancier restaurants here do not spill all over the beach, but they do still come right next to it. There is a lovely bakery that we particularly liked, as well as an awesome gelato shop. You certainly won’t starve in this town and it isn’t hard to find something. There are lots of accommodation choices, but the town is not over flowing with accommodation options either. There are quite a few lining the main beach road. We stayed at the Albachiara Hotel which was great. Our budget was fine as we didn’t pay for any activities and we self catered or ate at the bakery most of the time. We did have a nice dinner and cocktails on the beach on our last night. It was good value considering our surrounds. The menus I checked had mains around the 200+ peso mark or 400+ for the fancier places. 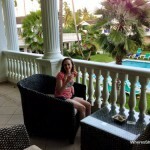 They loved our “holiday” in Las Terrenas, although sickness meant that there were some challenging moments. The biggest hit was the big pool at our hotel with the big kid area. They also loved playing on the beach. 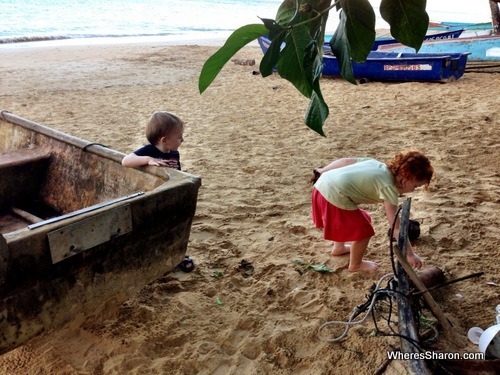 Las Terrenas was slightly more child friendly to walk around than other places we have been in Dominican Republic. The traffic was not as crazy and the footpaths in slightly better condition. They handled the journey here well. They are happy on forms of transport – lots to look at and experience, so they can be less trouble while travelling than when we’re in our hotel room!! We just wish we could have spent longer. It would have been nice to try more food places and to see the surrounding areas. It is also whale season in this part of the world, and we would have loved to have had time to do an excursion to see this. We loved our experience of seeing whales when we were in Argentina. 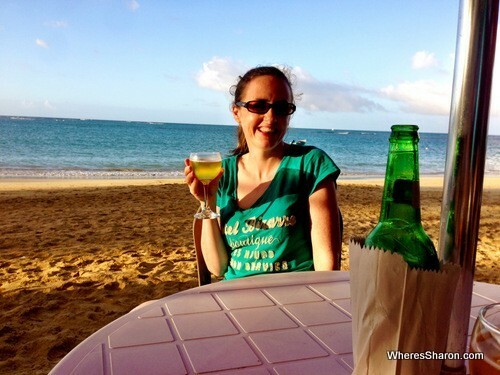 If we ever come back to the Dominican Republic, we will definitely be back in Las Terrenas! 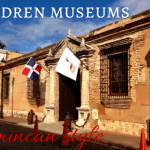 Museo Infantil Trampolin – Children museum Dominican style! 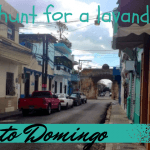 The hunt for a Santo Domingo Lavanderia! It sounds like a wonderful place, I love it already. Especially the fact there are so few resorts in the beach area. Ah it looks like a very sweet small beach village! Sadly your kids were sick 🙁 Hope they are feeling better now. I love the relaxed feel of this area. A beach that is not heaving with people, is here I love to be. Well that and a beach side restaurant – how awesome. 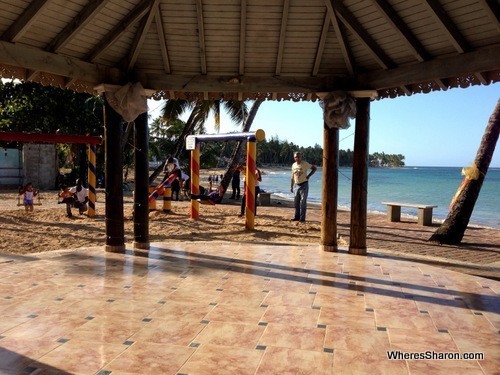 Las Terrenas is a charming little village, very quiet in the off season (December to April).